This Ritron RQX-151-XT wireless callbox operates on a VHF 150-162 MHz frequency (narrow band), has a 1W power output, and is intended to operate in an outdoor environment. The unit can be programmed to automatically identify its location to the responding radio. It operates on six D-cell batteries (alkaline or Ni-Cad, not included) and has an optional AC power supply (not included). The fiberglass enclosure has a stainless steel faceplate for durability and can be permanently mounted with an optional bracket (not included). 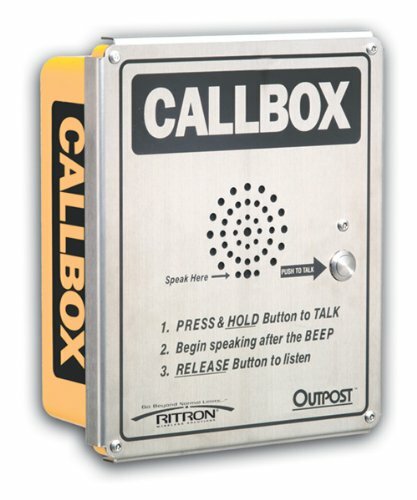 This wireless callbox is suitable for use where a wired connection is not practical, such as across a campus or at a gated location. Ritron manufactures wireless voice and data communication products. The company, founded in 1977, is headquartered in Indianapolis, IN. If you have any questions about this product by Ritron, contact us by completing and submitting the form below. If you are looking for a specif part number, please include it with your message.